Chris, Chaos and Mayhem of Stumbling Over Chaos are now settled into their new home (YAY!) 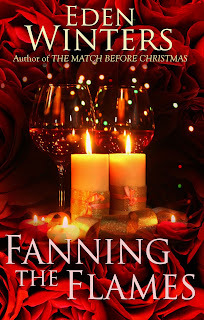 and offering up a copy of my recently re-released Valentine's Day novella, Fanning the Flames, sequel to The Match Before Christmas. Hurry over there and get your name in the hat. (Lovely new cover by Jared Rackler, of Jared Rackler Designs. The man of Barry's dreams has gone from a sugarplum fantasy to sweet reality, thanks to the GLBT dating site GetaDate.com. Introducing a new boyfriend to the family and settling into coupledom aren't the easiest things in the world for a man with little dating experience, but the romantic demands of Valentine's Day are beyond Barry's imagination. His piteous cry for help brings all kinds of suggestions from family and friends.Fully believing he's found the perfect ways to charm his sweetheart, Barry isn't prepared to hear "Achoo " at every turn. Adam's allergic to what? And will sneezes and welts wreck Barry's painstaking plans for Fanning the Flames? Fanning the Flames, now available at All Romance eBooks, Amazon, and other ebook sellers. Thanks for hosting the contest. I'm glad you and the kitties are settled into your new place.